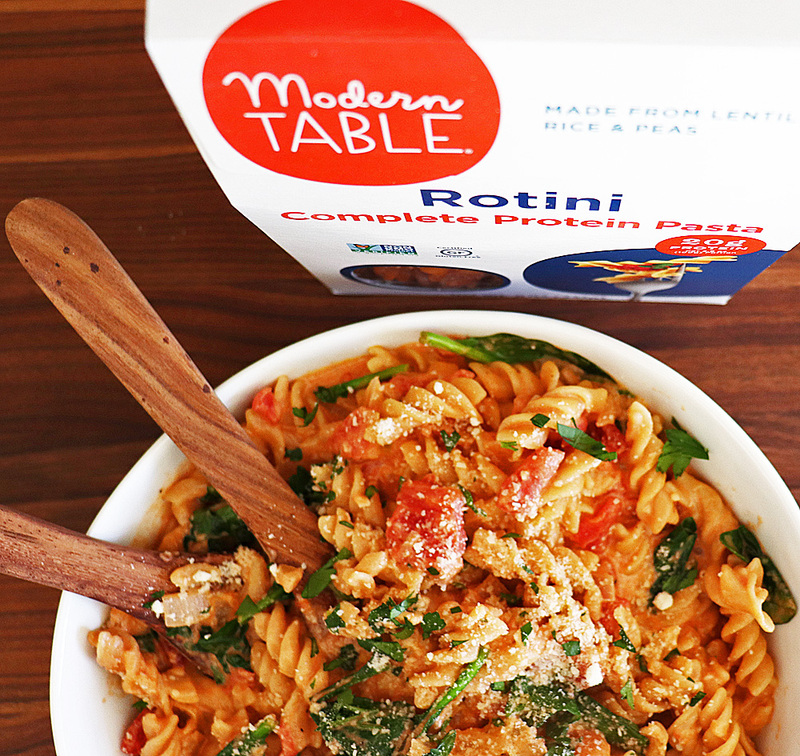 I’m thrilled to be partnering with Modern Table to bring you this vegan, dairy-free and gluten free Rotini in a Tomato Cream Sauce. 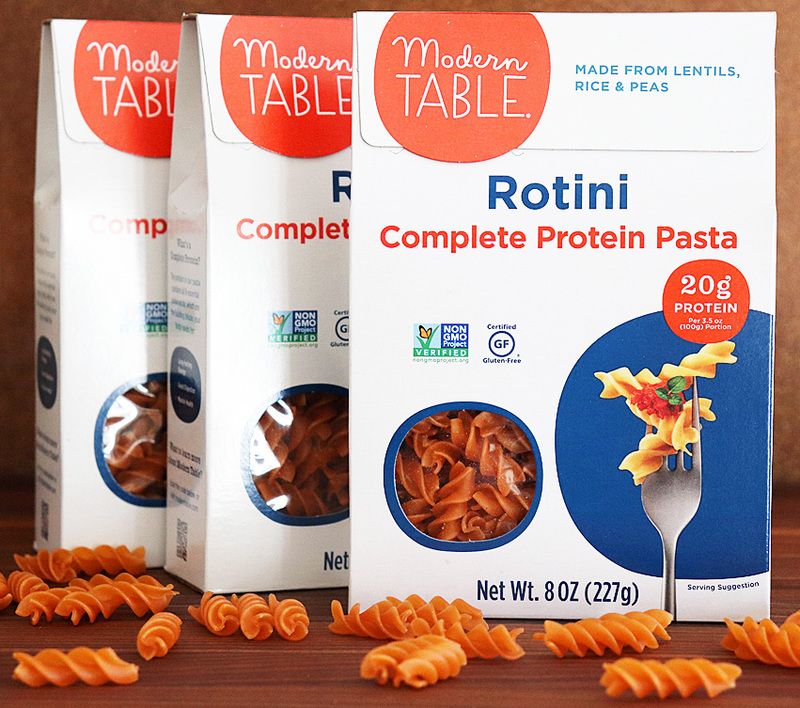 I absolutely love Modern Table Rotini. Made from lentils, rice and peas, it is a complete protein. 20 grams per 3.5 ounce serving to be exact! 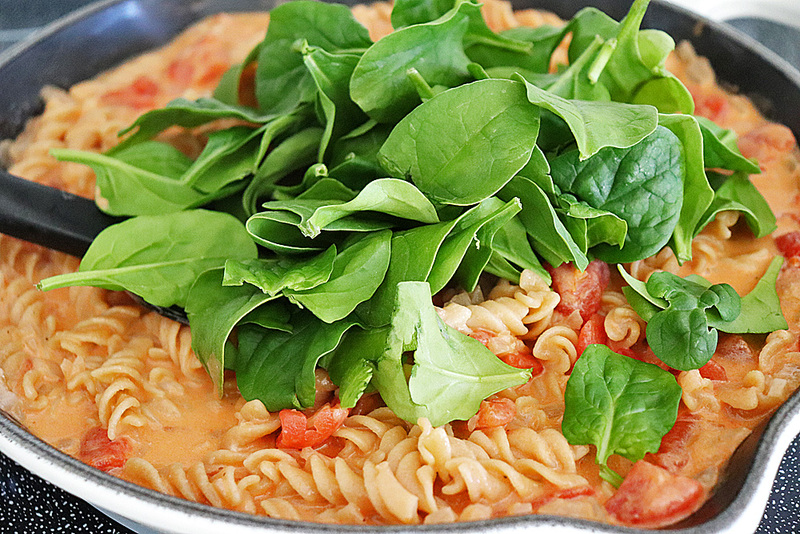 All of Modern Table‘s pastas are lentil-based and are “complete proteins’. This means that they have the 9 essential amino acids our bodies need for strong energy, good digestion, and muscle health. 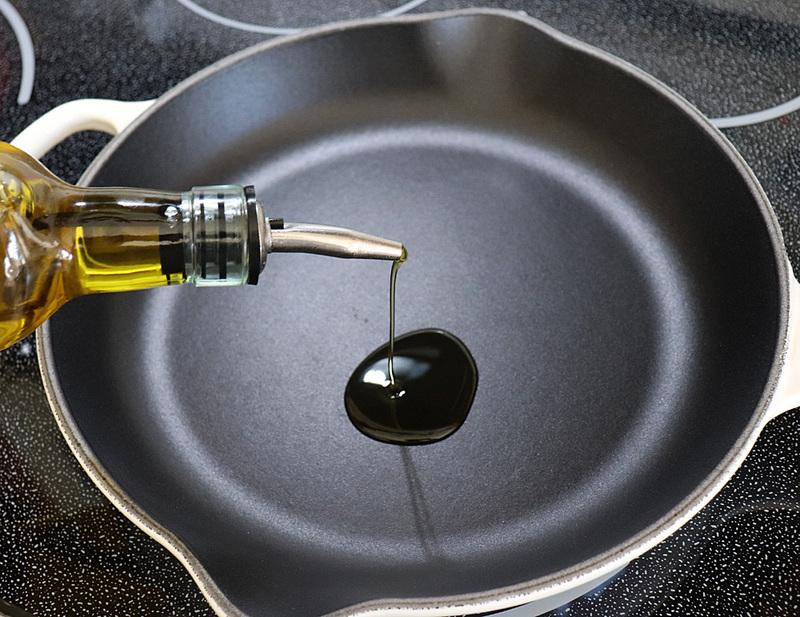 The first step in our recipe to to add olive oil to a hot non-stick skillet. To that, add finely diced onions. The quantity may seem like a lot, but we are going to cook these until they are caramelized and almost sweet in taste. Saute the onions until they are both translucent and slightly golden in color. This recipe calls for a splash of white wine to deglaze the brown bits on the bottom of the pan. It is cooked until all of the alcohol evaporates and leaves a wonderful flavor. I highly recommend using it in this recipe, but if you prefer not to, I would substitute with a good vegetable broth. 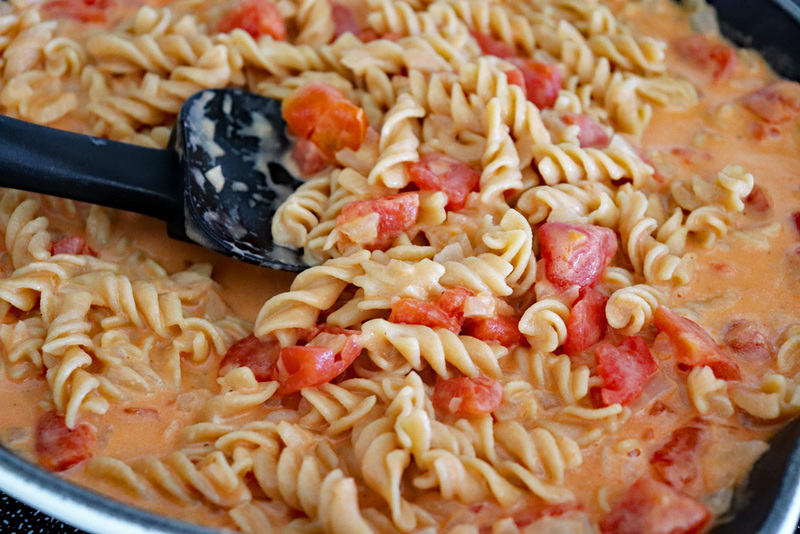 I’m using just plain ole large diced canned tomatoes and they are perfect for this recipe. Canned tomatoes are packaged at the height of freshness and are incredibly convenient, so why not? Be sure to add all of the juices from the can as well. 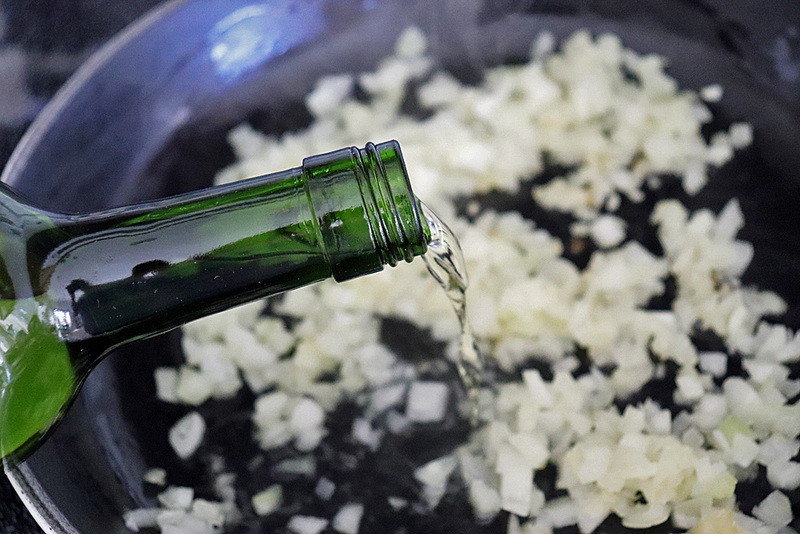 If you’d like to add minced garlic, do so now and cook for just 1 minute to release the flavors. You don’t want to over cook garlic or it will become bitter. 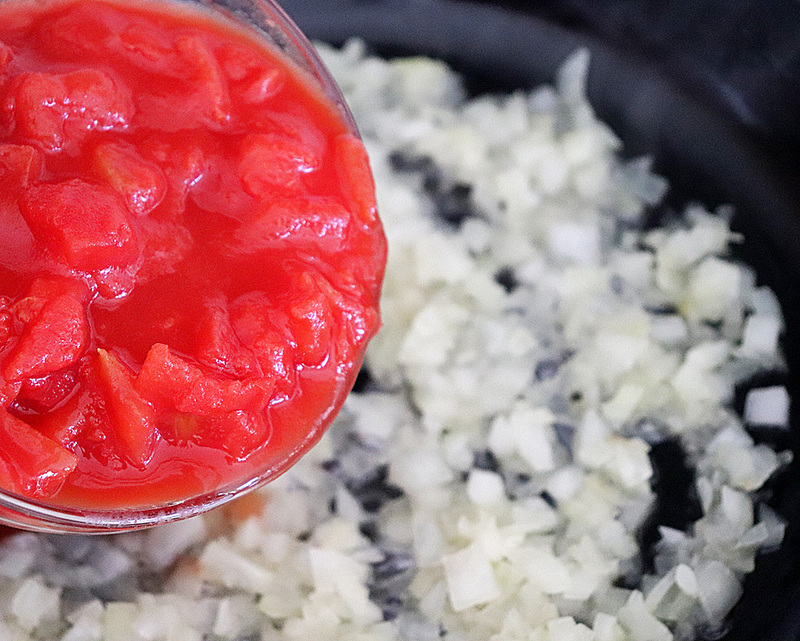 At this point I like to cover the onions and tomatoes and allow them to cook for a few minutes bringing all of the flavors together. 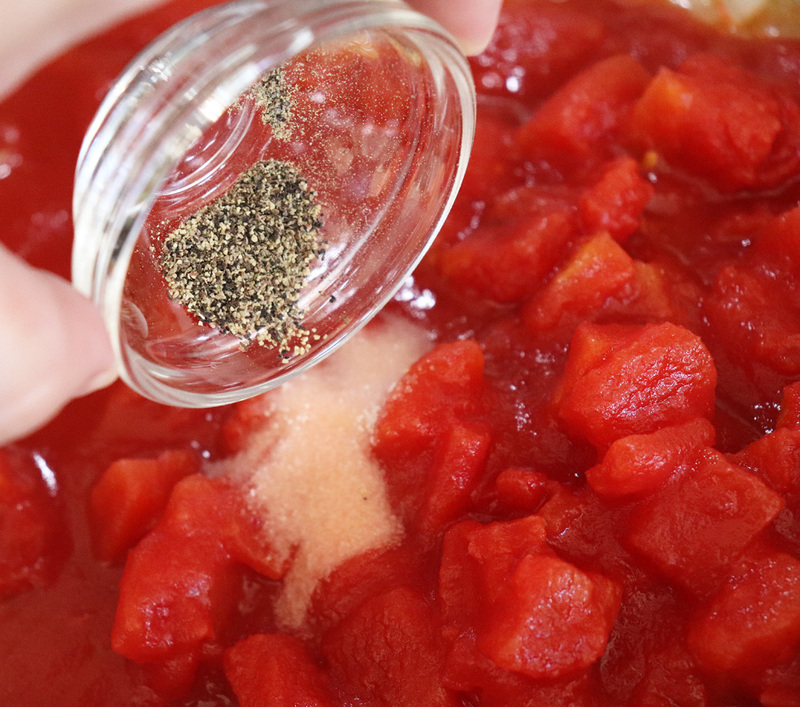 It’s time to season the tomatoes and I keep it very, very simple. Salt is a must! It’s purpose is more to bring out all of the flavors rather than to a add a “saltiness” to the dish. It also helps to break down the tomatoes a bit. 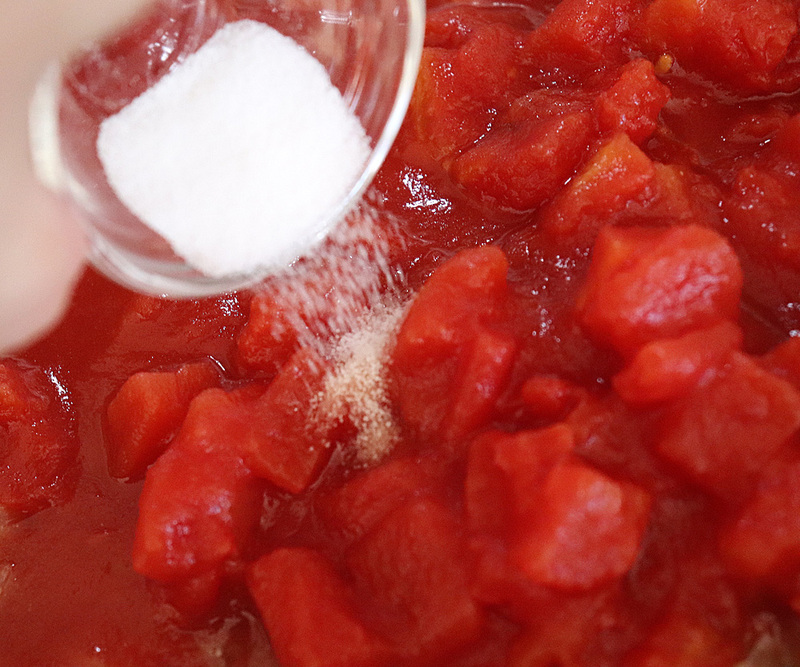 If you’d like a bit more salt, do so after tasting the finished sauce and just prior to serving. Freshly cracked black pepper is next. Follow that up with canned coconut milk. If you can find it, you could certainly use a non-dairy creamer, but read your labels. Not all vegan non-dairy products are gluten-free. 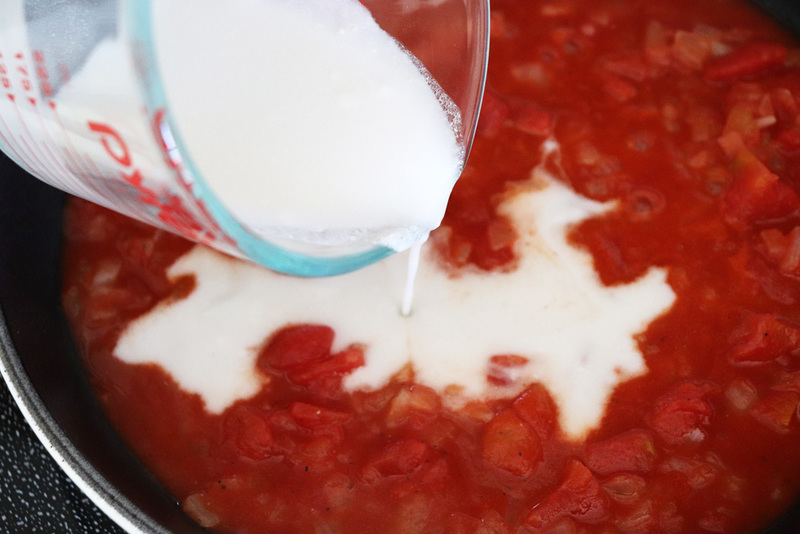 The coconut milk help turn our tomato sauce a lovely shade of pink! While the onions were sauteeing, I took the opportunity to cook the Modern Table rotini just slightly less time than the package instructions. They’ll finish cooking in the cream sauce. Give everything a good toss and cook the remaining amount of time. The sauce should thicken up slightly at this point as well. Optional add-in, spinach! 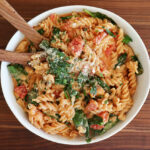 I love to add in a variety of different things each time I make this recipe, including fresh spinach. One big handful wilts down beautifully and gives this dish a really colorful presentation. Remember, we eat with our eyes first! It takes just a minute or two for the spinach to wilt down, so take it off of the heat at this point. 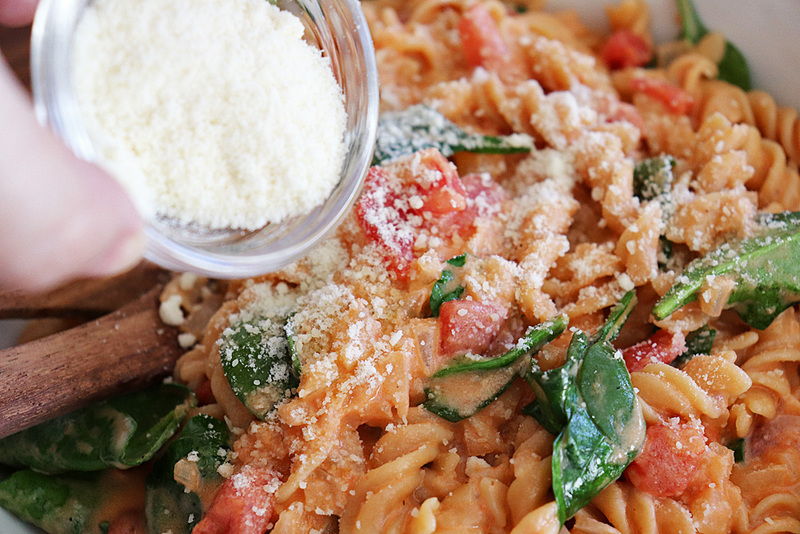 Another completely optional add-in is a bit of vegan parmesan cheese. There are so many options on the market and even online these days. Again, just be sure the label clearly states that it is gluten-free. 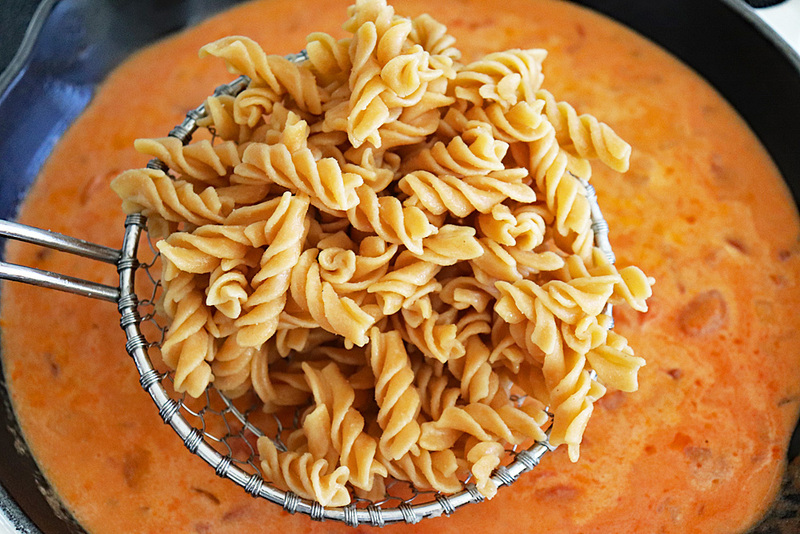 Freshly chopped parsley finished off this simple, yet elegant Gluten Free Rotini in a Tomato Cream Sauce. 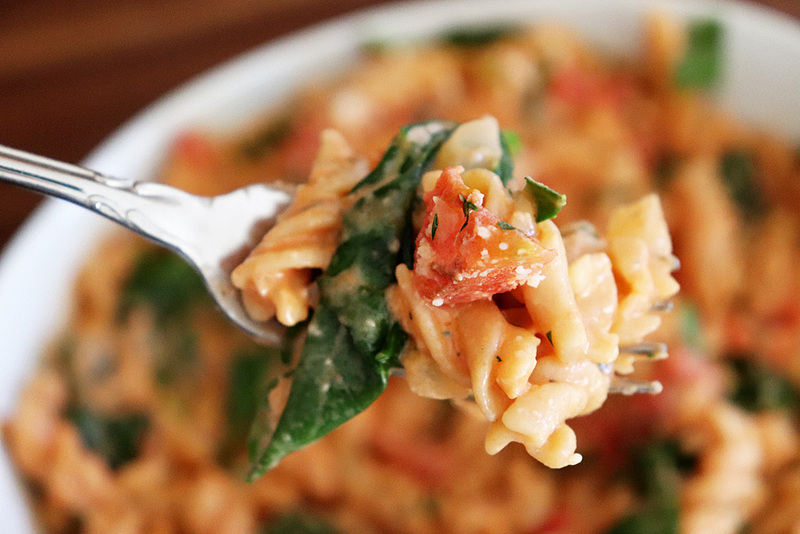 Be sure to pick up a few boxes of the Modern Table pasta and make this dish today. You’ll be glad you did! 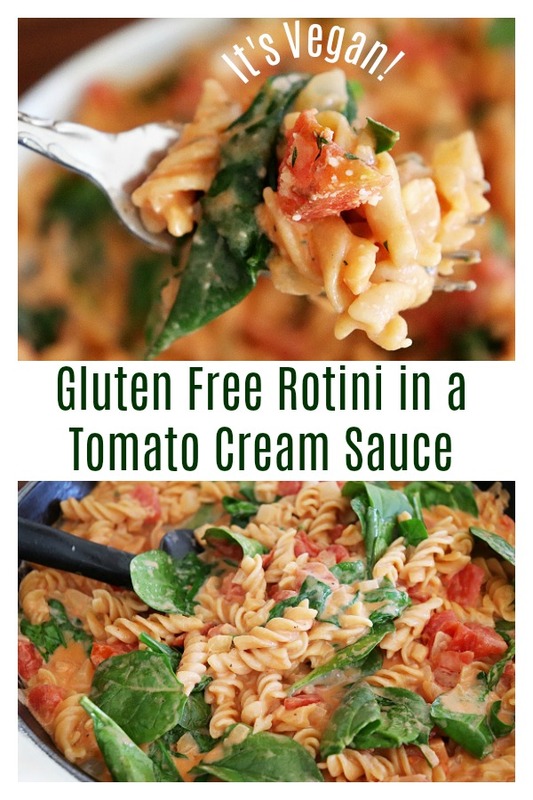 Did you make this recipe for my Gluten Free Rotini in a Tomato Cream Sauce? Leave me a comment below and let me know what you thought. In a pan over medium high heat, add olive oil and diced onions. Saute until onions are both tender and slightly golden. 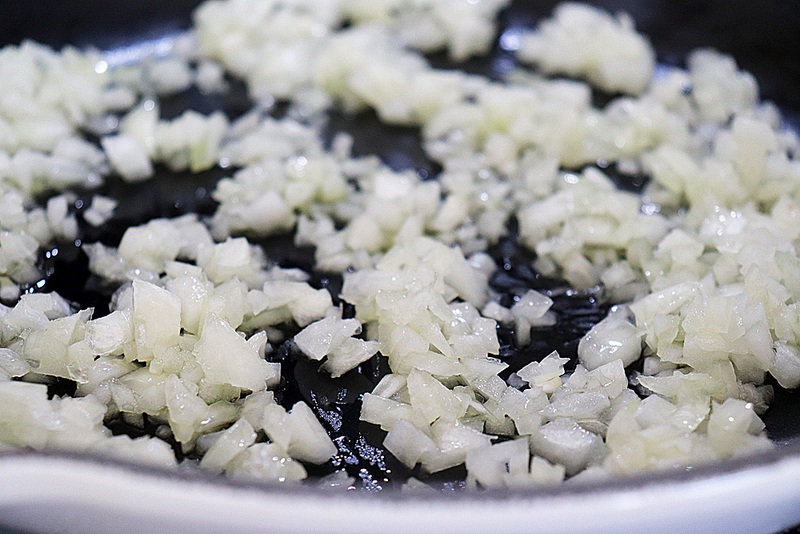 Add minced garlic, cooking for just 1 minute. Add the white wine to deglaze the pan cooking until the alcohol burns off. If for some reason you didn't want to use wine, use vegetable broth instead. 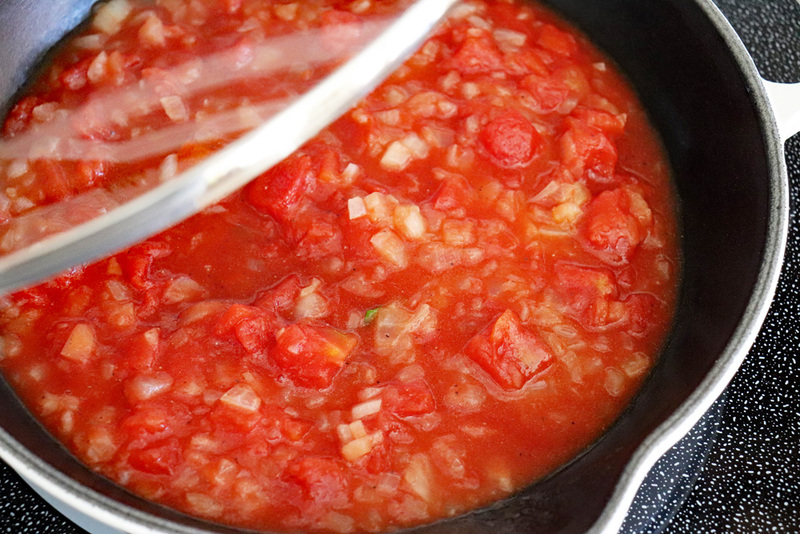 Add the diced tomatoes and cover for about 10 minutes until the tomatoes start to thicken a bit. Add Coconut Milk. Alternately, you could use a dairy free milk or creamer. Cook (uncovered) until thickened. Meanwhile, boil the MODERN TABLE Rotini until it's almost cooked. It will finish cooking in the sauce. Add the pasta to the sauce, adding more salt (or pepper) if necessary. 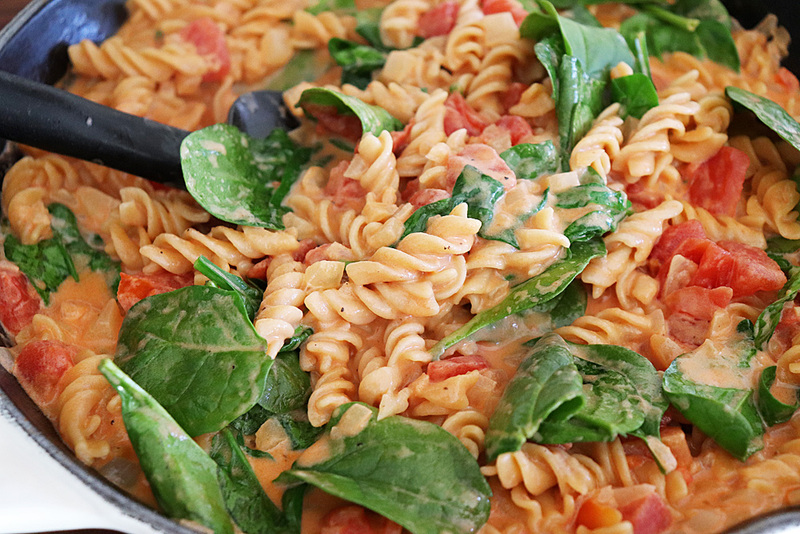 Add the spinach to the pasta and sauce, stirring until just wilted. 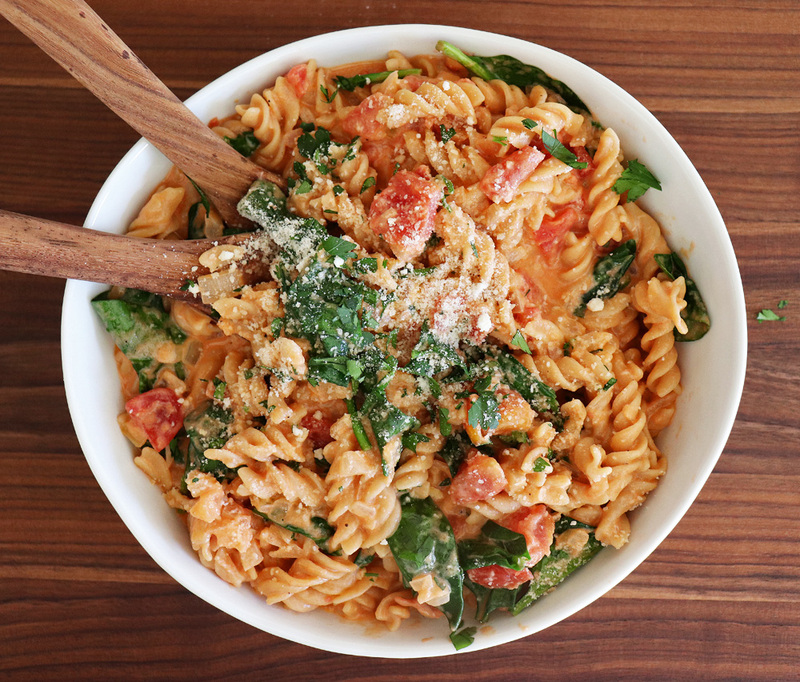 OPTIONAL: Top with a vegan parmesan (be sure to check the label if you are gluten free).